Lisa Peterson, the United States Ambassador to Swaziland (eSwatini), has renewed her call for political parties to be allowed to operate in kingdom. She also called for the 1973 Decree that turned Swaziland from a parliamentary democracy into an absolute monarchy to be repealed. It banned political parties and put all powers in the hands of the King. Peterson said this in an article she wrote that appeared in both of Swaziland's national daily newspapers. Peterson was reacting to the recent decision by the King to make appointments to the House off Assembly and the Swazi Senate, following September's national elections. People can only choose 59 members of the House, the King appoints another 10. No members of the Swazi Senate are elected by the people, the King appoints 20 and the House elects 10. Peterson said that the King failed to follow the 2005 Swaziland Constitution when he made the appointments. She said he did not appoint the required number of women. She also wrote, 'Former Minister of Justice Edgar Hillary went to Geneva in 2017 and told the United Nations Human Rights Commission that the 1973 Decree had been repealed by the Constitution. If this can be said to the outside world, why can it not be explicitly stated to the Swati nation? And if the Decree has truly been repealed, why do officials act as if it is still in place? She said if political parties were allowed to exist they would help women to organise. This was not the first time the US Ambassador had called for political parties to be allowed in Swaziland. She said political entities that supported parties in Swaziland needed to work on the ground to change people's minds about the value of political parties. 'Each party or grouping needs to go about it in the way that works best,' she said. She added, 'In addition to the various efforts the parties have underway, they need to be paying particular attention to this part of the equation. Because if a person living in a small village does not understand how a party can help him approach local leaders on an issue such as youth unemployment, the answer to that poll question is going to continue to go against the multiparty option. 'You also should not fall into the trap of thinking that simply explaining to people why parties are important, or holding a march to rally public opinion, will move the needle more in your direction. 'People need to experience policy advocacy in order to appreciate the advantages of a coalition. Otherwise, they will carry on doing things the way they always have, perhaps believing that no action can really make a difference. She is not alone in advocating for political parties in Swaziland. 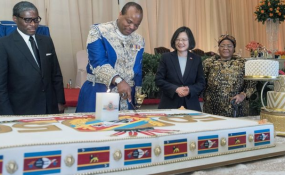 In 2013 the EU which is a major donor of aid to Swaziland told King Mswati he must allow political parties to operate in his kingdom as it was important that international principles of democracy were upheld in Swaziland.